Late October. Such an exciting time of transition. This is when everything really starts looking different in Oklahoma and when we officially trade our summertime pool parties for blanket-wrapped bonfires. 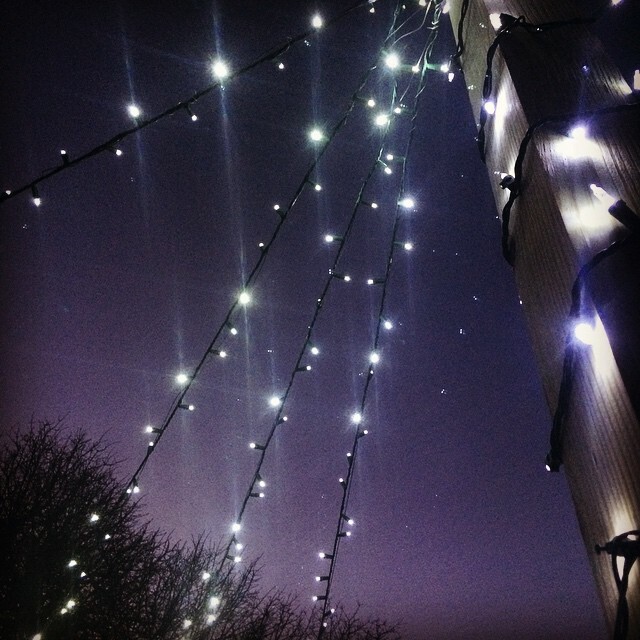 This week marks the uphill climb to that first tall peak of the roller coaster known as The Holidays. I groove hostessing. Maybe you call it entertaining or simply having people over. I straight up love opening The Lazy W to friends and family, sometimes my husband’s professional colleagues, even strangers. We indulge in this pretty often and for a wide variety of reasons. In fact, if ever too much time seems to be passing between special occasions, you can bet that I am thinking up an excuse to invite people here. Lots of different personalities living and breathing in this house, all over the farm really, eating and laughing and infusing these walls with their Love and energy, it’s what keeps this place alive. Luckily Handsome is on board with my passion for people about 87% of the time. That other 13%? I can usually bridge that gap with something chocolate. Like this. But with the holidays so close upon us, reasons and excuses to gather are about to be plentiful. This weekend we will dress up in costumes and share sweet treats, maybe attend a few parties and then sleep one extra hour Sunday morning. Handsome will be Batman, of course, the best Batman in all the land. 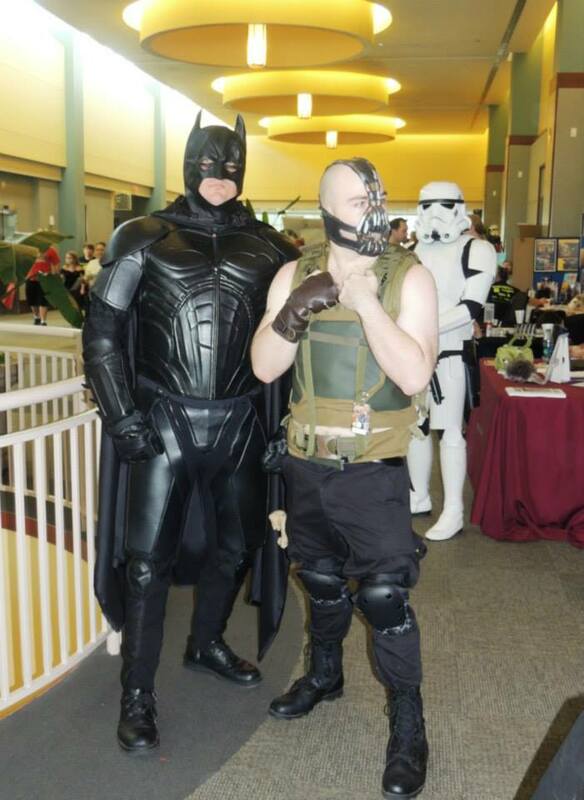 I will be at least four different characters to go alongside Batman, taking photos of him with random strangers. My costume criteria is always twofold: How much have I been running lately and not eating tortilla chips- can I pull this off? And also- will it leave me free to be Batman’s fans’ photographer? haha Yeah, we are definitely excited about Halloween this year! Actually I am looking forward to all the holidays this year! The gathering spirit has got me tight in its happy grasp. To me, preparing the farm for people is all about this: Love. 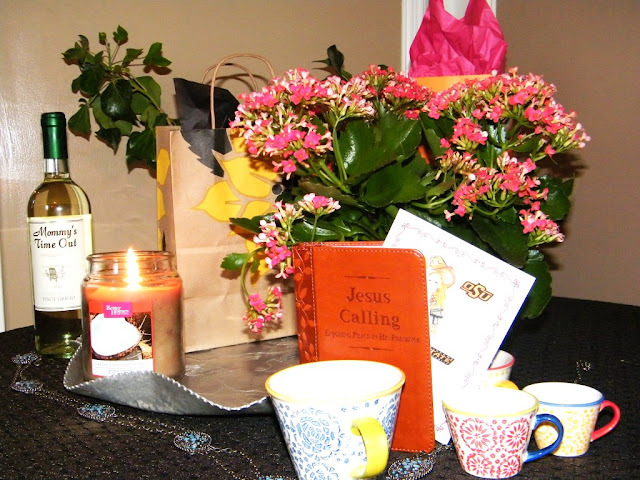 Why are we gathering, and how can I set the stage for Love to move freely between us? How can this event, whatever it is, meet needs and make memories for everyone? So the details of that are pretty simple: atmosphere, food, and comfort. ATMOSPHERE, LIKE NATURAL BLOOMS & PAPER DECOR: I love wild color around the house all year long, and when given a choice I will go for natural decor like real trees and indoor plants and flowers. 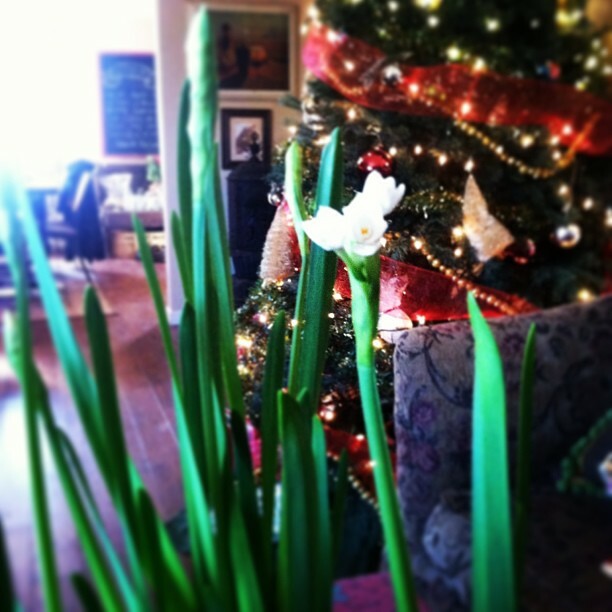 So for the wintertime holidays that means forcing bulbs, for one thing. This year, in addition to paper whites and amaryllis I will force some more colorful stuff, and it’s very exciting! At the Master Gardeners meeting next week, they are selling flower bulbs to members only and I cannot wait to see what they offer. Bring on the tulips and hyacinths!! The cozier months mean lots of yarn and tissue paper crafts, too. These are soft and inviting in any room, plus they are a relaxing way to keep my hands busy during movie marathons. THEMES Some of the themed parties we threw this past year were Oscars Night, Pizza and Board Games, Car Show Pinup (that was my husband’s surprise 40th birthday), and Fiesta. 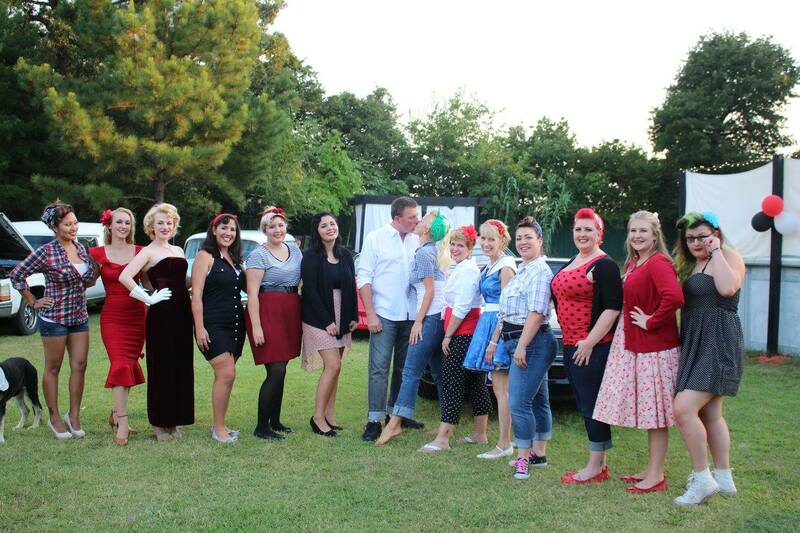 Each of these was a fully developed, top to bottom, inside and out themed party that just made us so happy. 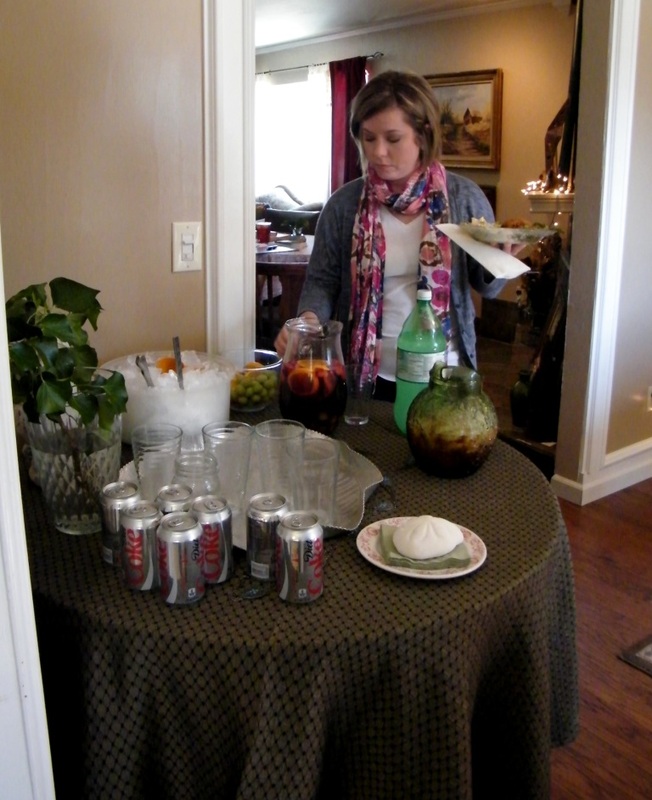 I love starting with the invitation and carrying the idea through food and drink, music, decorations, and activities. For the wintertime holidays, we will likely go for a cookie exchange, a a chili cook off, some Dirty Santa fun, and more. 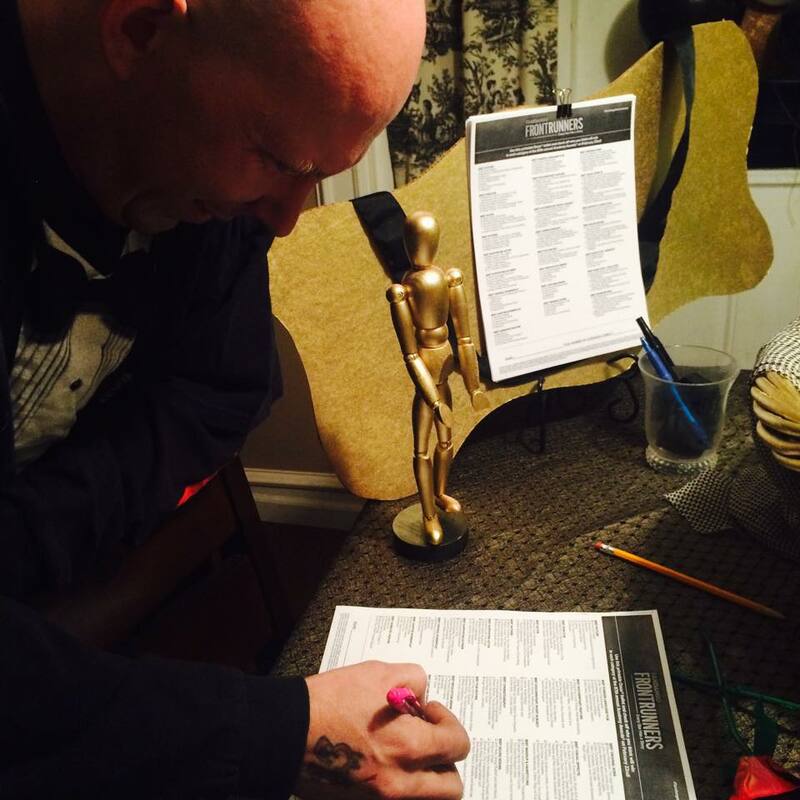 Our friend Joe filling out his ballot at last year’s Oscars party. Fun! FOOD Ahh, wintertime diet, you are so good and so bad. I foresee lots of baking. Lots of biscotti, lots of homemade chicken pot pie and chicken and dumplins, a pot of red beans and rice here and there, so much bone-warming food. We can totally throw homemade pizza parties in wintertime,too! Thank goodness for my new treadmill. 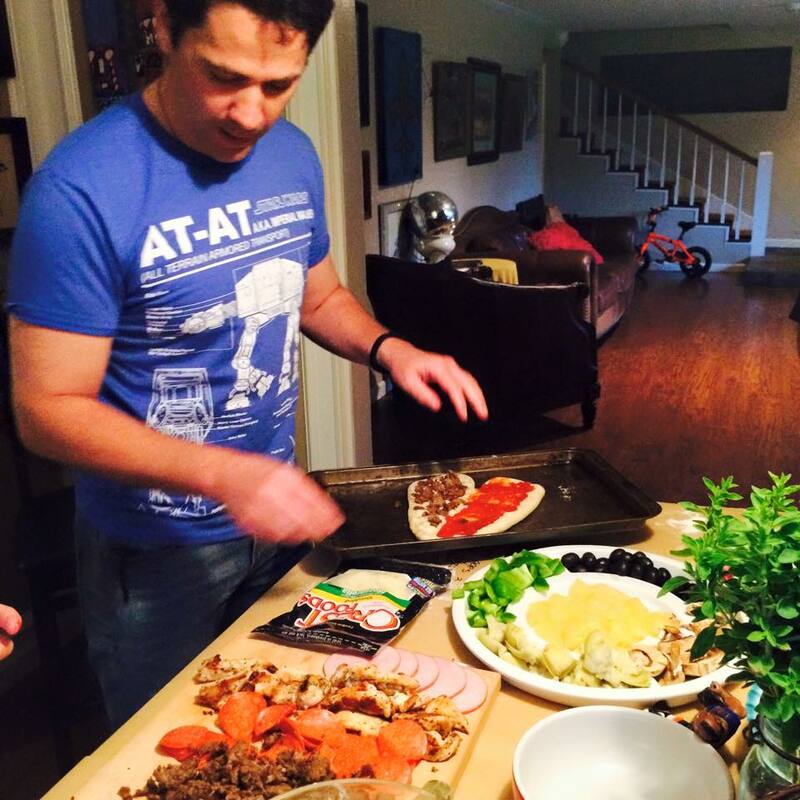 Our friend Jason crafting his pizza masterpiece. We had an exciting tornado that night and ended the evening playing Cards Against Humanity. My gosh. FUN. SNOW, maybe ICE All the almanac-type signs point to a snowier than usual winter in Oklahoma this year, so I am looking forward to lots of snowman building, snow angel making, snow ice cream, bonfires, fireplace chats, you name it. Snow is gonna be a fun excuse to cozy up and talk closely with people we love. 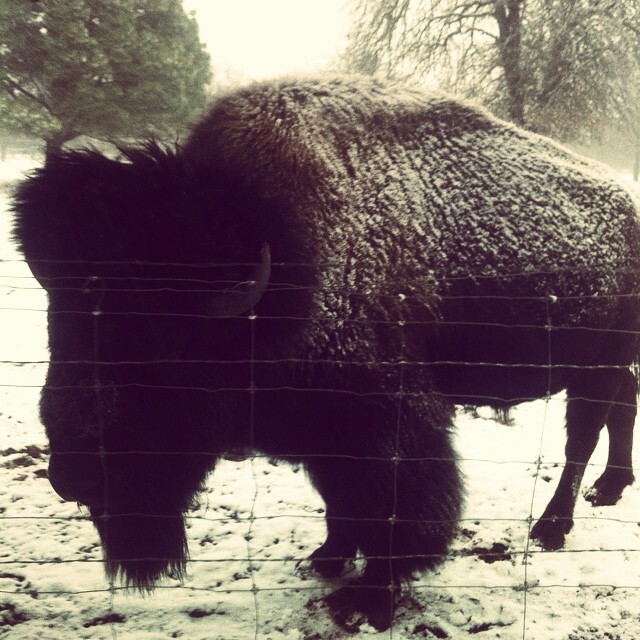 And our buffalo told me he is ready. SPEAKING OF PEOPLE Who to invite, and how to get them here? We are super blessed to move in several interesting circles of friends. Sometimes these circles overlap naturally, and sometimes we cause them to overlap, and this is always fun and interesting. 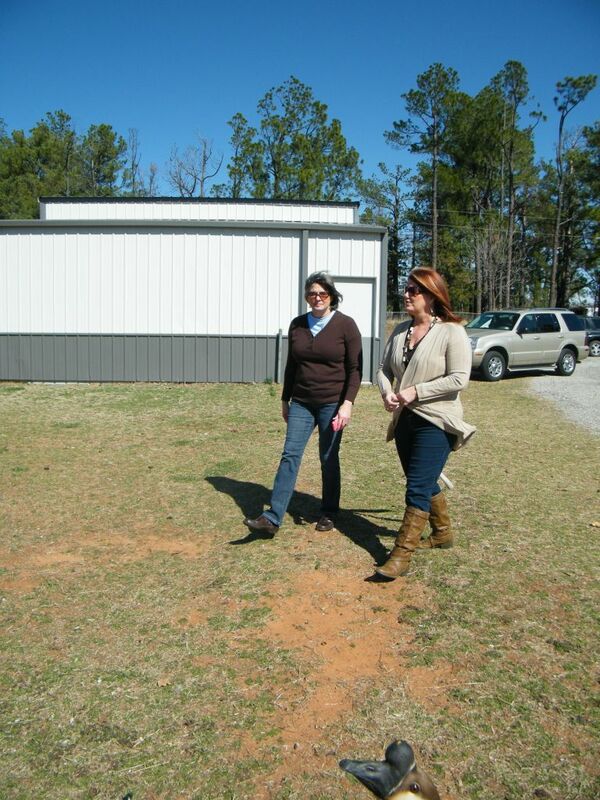 We have some wonderful, beloved local family, too, so gathering people at the farm is pretty easy. Usually it’s just a matter of how to spread the word? Until now I have always just texted folks or mocked up a silly Facebook event page. But recently I discovered Paperless Post and cannot wait to dive in! I am such a sucker for themed-out events, and this just looks so fun. They offer a huge variety of styles and prices; in fact browse just the free stuff and you’ll be blown away by the selection. It’s actually dangerous for a person like me, who is always looking for an excuse to gather her people together, because just seeing a pretty invite sparks ideas for new events. haha I mean click on this one, for example. Hilarious! Check out all of their creative invitations right here. I literally explored for half an hour. SO much fun! Paperless Post can print your holiday cards, too, and I think I’ll try that this year. Nobody warn my husband, but I think we will have our portrait made soon. We will wear matching khakis and white shirts and big red holiday bows on our necks, and our new puppy will be stage center. Obviously. Or no, scratch that. We will wear acid washed denim and carry bow-staffs. Yes. Anyway, three cheers for gathering your people! One big extra loud cheer for the holidays and all the Love they bring us. Check out Paperless Post, friends, and let me know which ones you like. I am signing off now to see if any of my Halloween costumes fit. “Hospitality is present when something happens for you. It is absent when something happens to you. Yes, I am pretty sure that’s a real word. who are willing to share their passion. It’s what happened to me last Saturday when a small, cozy group of Oklahoma bloggers convened right here at our little farm for a few hours of chatting, nibbling edibles, and soaking up each others’ experiences. It was wonderful in every way. Honestly, I am still not sure how in the heck I scored an invite since every other woman there has been blogging far longer than me and has established herself in various ways both professionally and in the blogging community. But I am ever so grateful to Kelly from the Red Dirt Chronicles for her thoughtfulness. 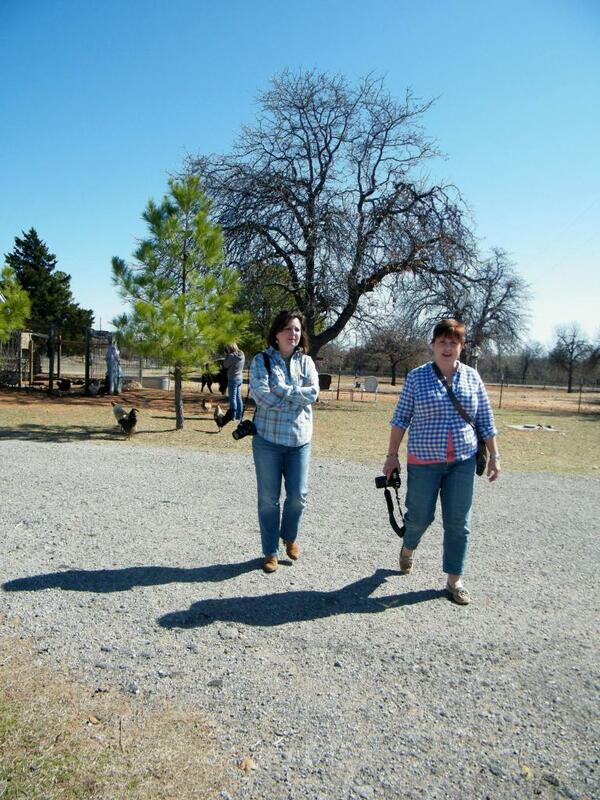 Here are Kelly and Dee strolling with cameras and kind words. Early on in the event’s planning stages I stuck my neck out and offered to host, trying to conceal the truth that I just meant to cement my attendance. I mean, eventually someone was bound to realize this *crazy* Lazy W lady was pretending to fit into the “real bloggers” club and then promptly revoke my welcome card. Have you ever seen Catch Me if You Can? Kind of like that. 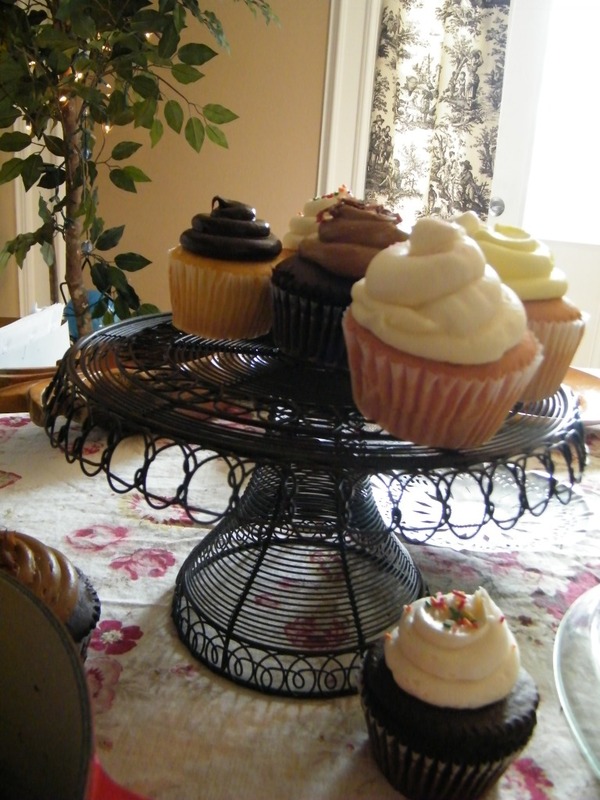 But if I was hosting, well… then my chances for retaining my invite just greatly improved. 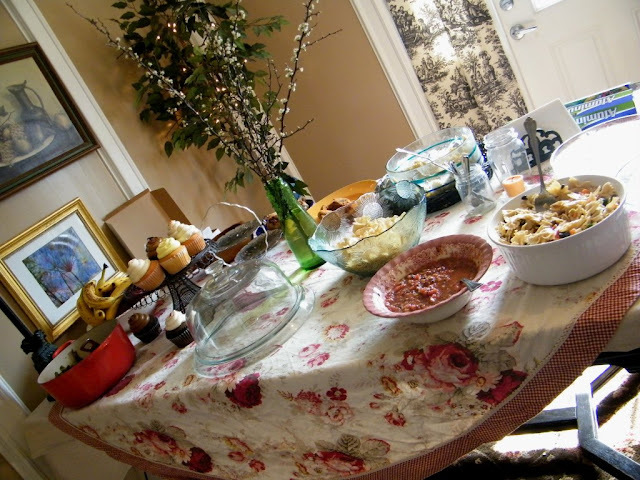 Several home made dishes and decadent bakery luxuries filled the table that day. Anyway, the other eight women who joined in on Saturday were just dazzling in every way. About another eight were invited and had to decline, but I know they would have dazzled me too. I certainly look forward to meeting them eventually. You may remember that last Saturday was a drop dead gorgeous day in Oklahoma. Bright sunshine, warm skin, cool breezes. As everyone arrived one by one and trickled down the driveway, we mingled outside and fed treats to the animals. Mia the gander bonded suddenly and passionately to Rose, one of the loveliest and warmest people you will ever meet. 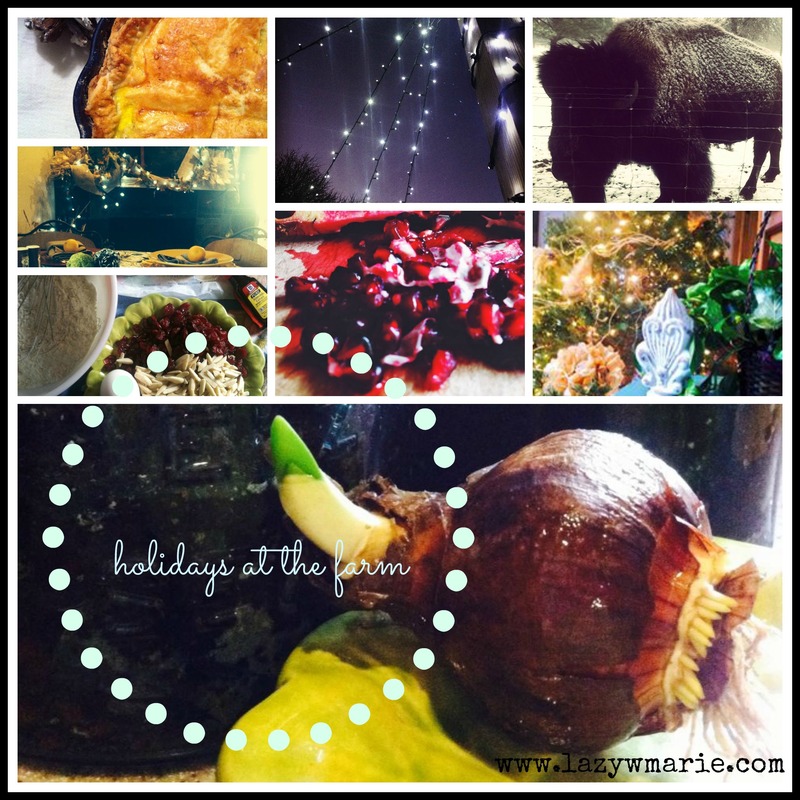 She has recently revived her blog OKRoserock, and I am so glad she did. Go find her post on International Women’s Day! 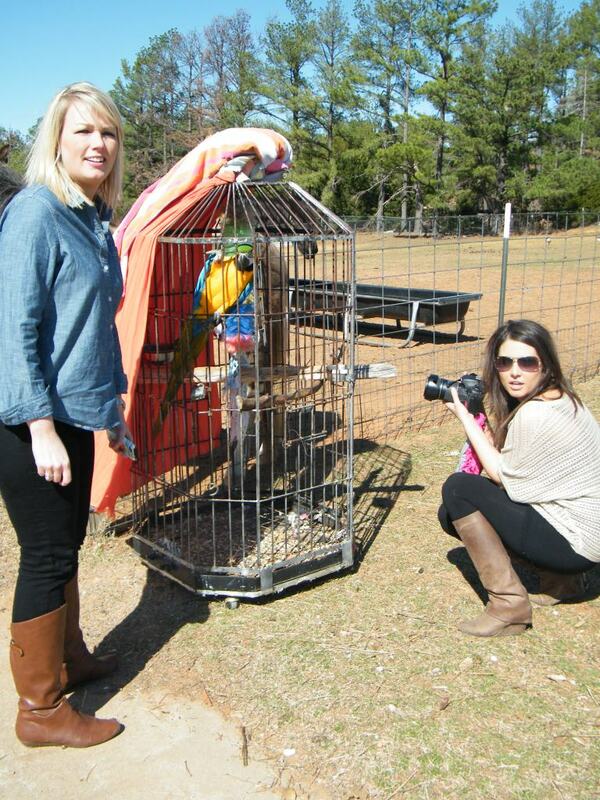 and moments later Brooke suffered some unwanted aggression from Mia the gander. I had the very real pleasure of meeting Sonya of Beyond the Screen Door, a woman whose exceptional seamstress work and talent for combining unexpected fabrics has been inspiring me for a long time. her opinion on a fabric idea for my kitchen. She is so gracious, I would have ended up taking advantage of her. Another guest was a kind of local celebrity, Katie from Dishin and Dishes. She is a food blogger who appears weekly on Rise and Shine Oklahoma. 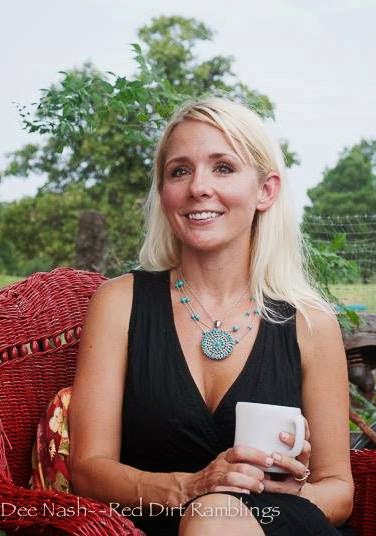 She is also in the final stages of writing a book surveying all the best local restaurants in Oklahoma! This will definitely be on my Christmas shopping list next December. then had lunch together the week after this event! the gander who chooses people to love. This day he had his sights on Rose, loud and clear. Allison is the super energetic talent behind Refunk My Junk. All of her ideas are fresh and pretty, and she makes it seem doable! Love that. If you’re in OKC, you can find her wares over at The Feathered Nest. We also discovered that she and Handsome worked for the same big box bank once upon a time. Cool! and her style really flows over into her blog. exactly the four seconds she wasn’t smiling and making friends! So sorry, but it’s kind of my talent. Dee is the talent behind the curtain at Red Dirt Ramblings. Her topic of focus is my not so private obsession, gardening… Oooh la la… Plus she has spun her skills and knowledge into a full blown writing career. This is what I am talking about, you guys! These things are actually possible! After some note trading and chatting, Dee and I noticed that her children are attending my high school Alma mater, Mount Saint Mary in south Oklahoma City. Small, beautiful world where we live, huh? Laura is a young, gorgeous professional who has been stylishly chronicling her home renovations over at The Steen Style. She is one of those women whose smile is bright and whose energy is contagious. In fact, she arrived at the Bloggers’ Ball (as it was cheerfully dubbed) with another lovely young woman, Brooke, and we all assumed they were lifelong friends. Not so! They had only met in 3-D that morning, on the way to the Lazy W. How’s that for making connections real? Brooke has been writing Rural Gone Urban for a while and recently launched a brand spankin new site for Chickasaw Country. Very exciting. Now she’s writing a children’s book, so keep your eye on her! These ladies showered me lavishly with unnecessary but much appreciated hostess gifts. The funny thing is they didn’t know it’s also my birthday week, woo-hoo! After we pressed the clock for every spare minute sharing stories, ideas, questions, and hopes for the future of our little group, everyone said goodbye and drove away from the farm. I was literally stunned into silence. Not the normal post-party fervor or exhaustion, just a wonderful, bizarre sense of possibility. Possibility for Oklahoma, my heart’s homeland. I could barely speak for about fifteen minutes. See… each of these women started blogging for intensely personal reasons (like me) and each has gradually discovered her voice, mission, and platform in her own unique way. Now they are evolving unapologetically and sharing those mindful resources. Collectively these bloggers were an ocean of knowledge on IT and had a firm grasp on social media, all of which is crazy useful to me. But their greatest gifts were openness and drive. Kelly’s Twitter stream of most quotable remarks during the session was priceless. “Blog drunk, edit sober.” Solid advice, ladies. Solid. In a nutshell, it was one of those times when life shows you exactly how much you don’t know but simultaneously offers you a chance to learn it all. And to learn it through some really delicious connections. I am whole heartedly looking forward to the next event and expect to see some of you between now and then, too. Thanks again for visiting the Lazy W, thanks for the gifts, thanks for the generous exchanges. Best wishes to everyone this spring and summer! Birds of a Feather Can Still Be Mighty Different. If I were a game show, I would want to be Wheel of Fortune. The hosts are never surly, always friendly. And apparently they don’t age. The puzzles are workable, not reliant on bizarre trivia or statistical luck. And, most importantly, no contestant goes home empty handed. I just love that. Not because I believe every child needs a trophy for every effort made in life, but because it’s just nice. Paying even the least winning contestant a $1,000 parting gift is the game show equivalent of a nice party favor. The best parties send people home with a little summin-summin. Happy First Anniversary, Book Club!!! In January of 2011, almost exactly a year ago as I write this, my friend Tina and I decided to start a book club. 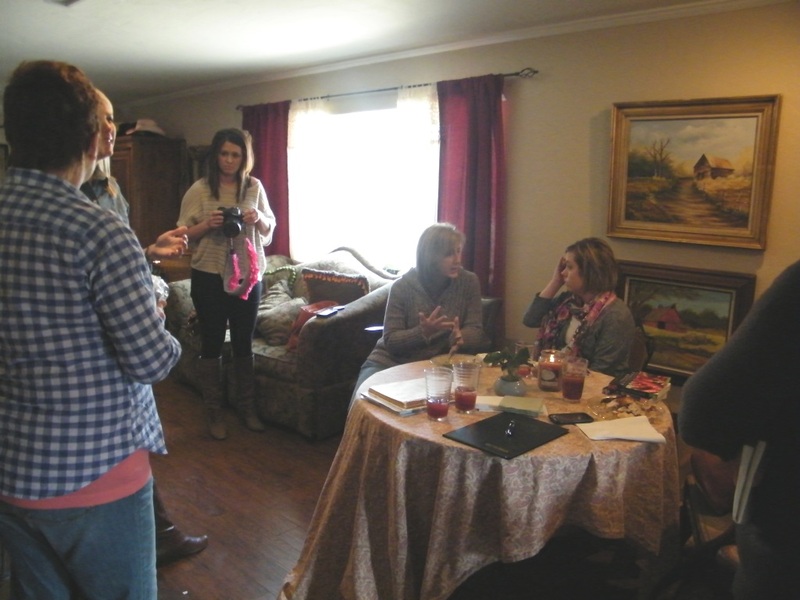 We each invited one woman to join us, making a group of four. I invited my cousin Emily, and Tina invited her coworker Desiree. It was awesome. Our initial goals were threefold: to get thinky more often, to expose ourselves to a greater variety of literature, and YES to socialize. Because we’re girls. We really had no idea how things would go. I mean, January is famous for quickly abandoned though brilliant ideas, right? for our little Oklahoma Book Club. Since last January, our group of four has grown to twenty-two. 22. TWENTY-TWO. Veinte y dos. That is a 450% growth rate, you guys. And we didn’t advertise or anything; it’s all been just by word of mouth. In fact, in late October we made the rather uncomfortable decision to close enrollment due to a potentially unmanageable crowd. Seating and feeding people is one thing; but more importantly, in gigantic crowds we lose the intimacy needed for really satisfying book discussions. In our first year we devoured eight novels as a group and have shared many hours of great conversation with each other, exploring and debating the content of these selections. We’ve laughed, we’ve cried, we’ve made each other blush. We’ve challenged our belief systems. Thanks to a Los Angeles book industry hook up we have with one of our members (her name rhymes with Frulia) , we even conducted a telephone interview with Aimee Bender, the author of one of our books! DO YOU KNOW COOL THAT IS?? So cool it’s almost awkward. As suggested by our club name, Dinner Club With a Reading Problem, we also eat. We eat really well. It goes without saying that every one of our gatherings has been a passionately convivial affair, sometimes themed to the book and other times a wild pot luck free-for-all. Even the self-proclaimed kitchen-challenged among us have participated happily, and we’ve traded fun recipes along the way. Again, because we’re girls. Reading has never been so much fun. We always set attainable deadlines depending on the time of year and most members’ life groove at the time, so that no one seees book club as a burden or work. We keep in touch with each other throughout the reading weeks. And we have grown to know each other in deeper ways than you normally do in a casual acquaintance. Hearing a woman’s thoughts on a hefty read can reveal incredible things about her life and heart. So anyway… If you do not yet have a book club, I double dog dare you to start one. It will not cost you much time or money, and what it DOES cost you will return to you tenfold in a rich life experience. Curious about who we are or what we’ve read? Among the group we have 13 children and 4 grandchildren, ranging from infant to college aged. Roughly one third of our members is married, one of them being half of a Derby Union. More on that another time. Professions: By coincidence, a different one third of our members is in number-crunching professions. Accountants, analysts, IT whizzes, auditors, etc. Also in the group is a paralegal, a credit union manager, a college student/part time employee/ Mom of two teens, a literary publicist, a hair design student, a computer nerd, a social worker supervisor, a receptionist, a project manager for a major investment house, an oil & gas accounting/ payroll manager, a verification associate, and a dorky farmish blogger. We are a motley crew, and I love it. By the way, you can find my reviews for most of these books somewhere on this blog. How Do We Choose Our Books? In the beginning we planned to take turns like nice, polite little ladies. I mean, there were four of us. It was easy. Then throughout the year, as membership grew, we started kind of stabbing in the dark, just sort of brainstorming over plates of food and deciding wildly what to read next. It was working out alright, but last week we decided to take a slightly more orderly approach in 2012 and draw names two months out, that person being the one to choose our next title. We meet every six weeks, more or less, and we recently started meeting at different places! All of our 2011 events were here at the farm, which I loved dearly, but I also love going to other people’s homes, and fortunately our group is overflowing with willing hostesses. Another member (her name is definitely not Margaret) has been making six hour drives from Austin, Texas to join the fun. Still another member (her name rhymes with Blephanie) reluctantly picked up the burden joy of reading by joining the group for a book she had started three years prior but never finished. And guess what? She not only stuck with us; she hosted the next party! Personally, I am amazed to discover so much depth and stimulation at such an easy price. The events plan themselves, really, because we are all so eager to see each other and spill our guts about the books. We definitely have found some kind of magic here, and I can see it lasting many years. So Happy First Anniversary, Ladies!! You have each found a very special place in my heart because of this uncommon adventure. I have thoroughly enjoy getting to know everybody and stretching my reading muscles beyond what I would read on my own. Please stick around… 2012 is going to be incredible! On New Year’s Day I visited my parents’ house in Oklahoma City, had a GREAT time all afternoon, and drove back to the farm with my heart full of love. It’s always fun to see everyone in our big ol’ family, and it turns out that I didn’t even leave that early, didn’t even miss that much of the party. Later that evening I did some goofing around on Facebook and saw photos of lots of people on my parents’ front porch. People I did not recognize. Sitting in the same deep, reclining wooden bench where I have sat my whole life. Covered up in blankets in which I have been cuddling daughters and nieces for years. I crinkled my face and searched my memory. Not a scrap of a clue as to these crazy weirdo people’s identity. Nothing. “WHO THE HECK ARE THESE YAHOOS?!? !” I may or may not have shouted at my laptop. Then I typed a slightly more polite version of my question on Mom’s Facebook page. She never responded, and I can only imagine her shaking her head in disappointment, pursing her sweet mouth and blinking slowly. The issue has been on the back burner for a couple of days, but the heat has been on. My curiosity, nay, my sense of trespass, has been simmering. So… Today I went to see my Mom at her office, enjoyed some very sweet chit chat, and was introduced to several of her coworkers. Very nice people. Not strangers at all. Then the matter of Strangers on the Front Porch was raised. I took a deep breath because anything was possible in that moment. She could be telling me about siblings I never knew I had. Or that she and Dad had taken up Couch Surfing. Or that I was mistaken in my comment typing and that wasn’t her Facebook page at all, but rather a different Parents’ House Front Porch in an alternate reality or something like that. Nothing could be further for the truth. It turns out that Mom was just being Mom. I’d love to tell you what happened. A work crew installing fencing down the street had hit a high pressure gas line. This is a serious accident, of course, but fortunately nothing exploded and no one was hurt. The worst that happened is the temporary evacuation of all the people on that side of the street. Mom said that among the evacuees was a family that had just bought their house; they hadn’t even finished moving in yet. 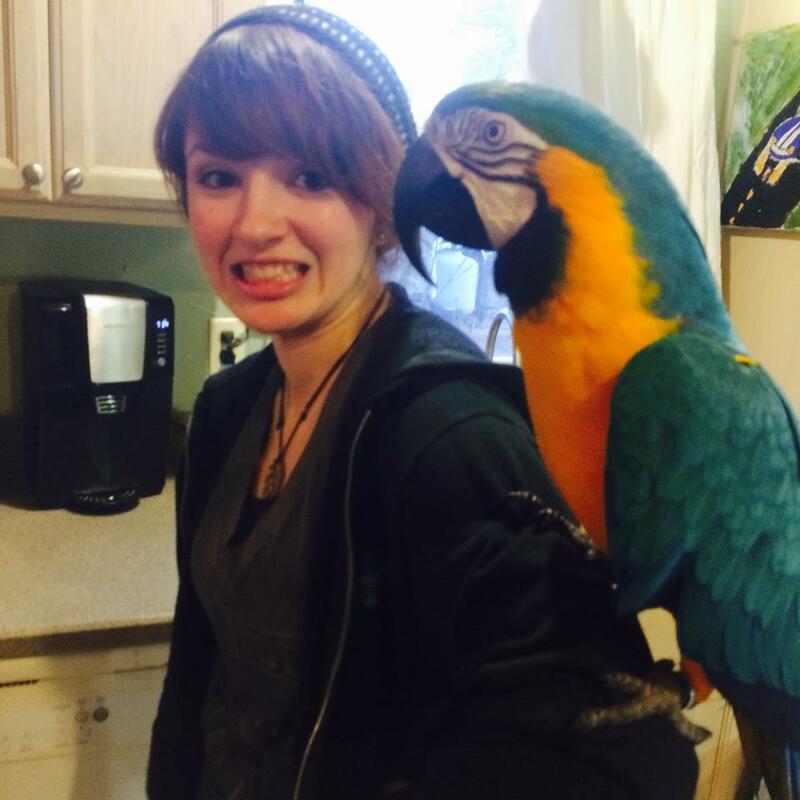 Mom invited them to her house, where she was still entertaining extended family, may I remind you. They piled onto my childhood her front porch, feeling too cautious or too polite to immediately accept the invitation indoors. Mom said they all sat on the front porch for a while, sharing blankets and hot chocolate. Getting to know each other a little bit. And judging from the big smiles on these yahoos‘ Mom and Dad’s new neighbors’ faces, everyone was having a great time. Mom told me that later in the evening (it was an hours-long evacuation) they went inside and even ordered pizzas and played games. And that is the story of Strangers on the Front Porch. Wow. 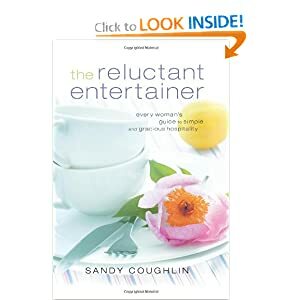 And to think I almost ordered my sweet Momma a copy of the Reluctant Entertainer book for Christmas. She doesn’t credit herself in this way, but she is a natural hostess. Her heart is in exactly the condition that hostessing requires: open, warm, and sensitive to the needs of others. Ready to bless, not impress, as Sandy Coughlin teaches. Okay, I am definitely ordering her the book anyway. She needs to know how natural she is. I love you Momma. But seriously, Open Your Hearts Before You Open Your Homes.